Hello fellow antique lovers. Here is my guide to shopping for antique and colonial furniture in Mumbai, written for April edition of Chalo! Magazine. Before I moved to Mumbai and my husband was left here on his own hunting for an apartment, I envisaged that we would end up in a dreamy colonial bungalow filled to the rafters with elegant furniture – plantation chairs, four poster beds draped with muslin wafting in the breeze and a study furnished with a fine Art Deco desk and one of those huge globes that would double as a drinks cabinet. Well it didn’t quite work out like that as we now occupy a modern 11th floor apartment with magnolia walls and cream tiled floors – and a heap of disgusting laminate furniture put there by our landlady. Don’t get me wrong – I love our abode with its sea views and sunlight flooding through the sliding doors - but the place in no way fulfills my romantic notions! No matter. Since moving in, I have been gradually moving out the offensive items (which included a revolting black vinyl three piece suite), replacing each one with our solid wood finds. I have a particular passion for antique colonial furniture (even before I left the UK) and so we spend many a weekend hunting down suitable pieces. Furnishings that will not only fit our modern Bandra apartment but that will also suit our future home in the UK. So I will now share with you my favourite places to shop. Note: I like a bargain. Some places in Mumbai (which I will still mention here), charge the earth so I will therefore focus on ‘good value’ and the ‘thrill of the hunt’. Top of the list has to be Camelot in Kemps Corner. The Camelot shop is a beautiful colonial villa worth a visit in its own right and I like the elegant, unfussy style of the place. There are two large rooms filled with genuine colonial antiques including armoires, huge plantation chairs, art deco desks, mirrors and the occasional artwork. I have picked up a couple of side tables here for around 6,000-8,000 Rs each. The prices are extremely realistic and the quality is good – each piece is handpicked. The armoires and mirrored cupboards are in the 20,000 Rs range. Unfortunately, the place was outed after I wrote about it on my blog, and every time I go back the stock is relatively low but there is still enough to create interest. 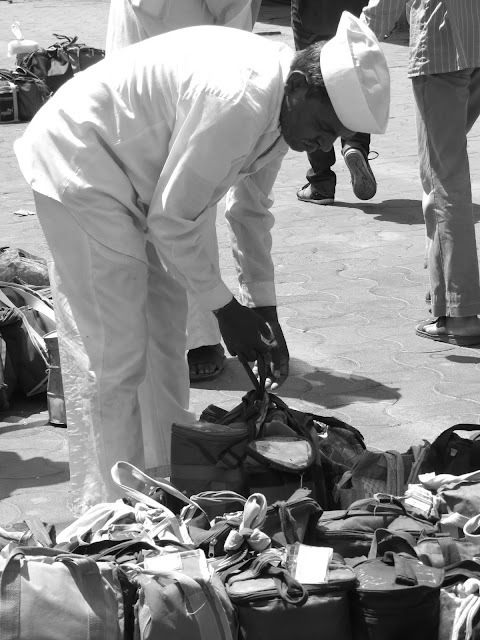 Antique shopping cannot be mentioned without touching on good old Chor Bazaar. I could spend hours on Mutton Street, sifting through trinkets and Bollywood Posters and going up and down the many narrow shops bulging with dusty furniture. You have to be able to haggle though. We found a beautiful rosewood Indo-Portuguese chair for 18,000 Rs (the dealer started at 30,000 Rs but we still may have paid over the odds for that one) and a basic art deco wooden chair for only 4,000 Rs. The latter was reproduction and you will have to look very closely if you want the genuine article. Personally, I’m not that fussed providing the look is right and the item is teak or rosewood. We also purchased a whole art deco sofa suite for about 40,000 Rs. When we discovered it in a filthy old attic of one of the showrooms, it was a complete wreck. But with the help of the dealer’s restorers, it was easily brought back to life with a fine polish and new upholstery - all included in the above price. (I haven’t mentioned any specific dealers here – there are so many you just need to hunt around, comparing prices from shop to shop). Oshiwara Furniture Market in Jogeshwari is similar to Chor Bazaar in concept. But it’s not as much fun. I find the antique dealers a bit surly and not so ‘up’ for haggling. And you will need plenty of energy and mosquito spray whilst you repeatedly tread up and down the many (very) narrow shops. A lot of the stuff is repro (especially the art deco pieces) but any purchases can still go towards creating that beautiful colonial look. We have picked up teak art deco style occasional tables for 4,000 Rs. If you enjoy the hunt, you will certainly enjoy Oshiwara. furniture with prices to match. For sheer designer class with huge prices to match, you want to visit The Great Eastern Home. Set in an enormous mill complex, the many showrooms are spread over a very large area - all beautifully dressed and stocked. I find the place a bit daunting and there is always someone following you and rushing to switch on the fans as you go from room to room. But there is no doubting the quality of the inventory. Coffee tables, mirrors and small chests are going to set you back tens of thousands of rupees and the larger pieces…well I haven’t bothered to enquire! Definitely worth a look if you have the budget and want to do a ‘one stop shop’. Similarly high prices and quality can be found at the The Raj Company. Opposite Mahalaxmi racecourse is a large building where you can wonder around unhindered. The ground floor contains all the genuine antiques – mostly in an unrestored state, which you can then have brought back to life using their team of craftsmen. I enquired about an art deco suite and they quoted 1 lakh to restore, upholster and deliver – so about 100% more than the suite we purchased in Chor Bazaar. On the floor above is a warren of rooms displaying beautiful reproduction campaign chests, wardrobes, beds, dining sets and much more. All top quality stuff with prices to match. The famed Philips Antiques in Colaba sells mostly artefacts, engravings and other easily transportable items for tourists. What you may not know, is that they also have a huge warehouse in Wadala East which showcases very nice antique colonial furniture that has all been beautifully restored. Their art deco pieces (my particular passion as you may have guessed) are to die for. Again, the prices are pretty toppy (tens of thousands of rupees upwards), but if you want something with a reassuring provenance, then this is the place to come. Moorthy's in Tardeo is a recent discovery - a large warehouse tucked away up a narrow lane filled to the rafters with the most beautiful finds. You will need at least an hour for a proper browse as everything is stacked high and some of it well hidden. If you have a particular requirement, Mr or Mrs Moorthy will assist you in finding and adapting a particular piece. For example, a 200 year old Gujurati cradle that we had converted into a coffee table. Prices are on the steep side but you can be assured that your purchase will come with a good story or history. Fancy something a bit more bespoke or made to measure? Try Colonial Collections in Fort. The shop is quite small so there are only a few examples of furniture on display (including elegant sofas for around 1 lakh). But rifle through the many brochures and you may well find exactly what you want – they will re-create it for you using their team of skilled carpenters. I was quoted 45,000 Rs for a 40 inch square, solid teak coffee table with glass top. They seem to favour the unfussy style of US brand Stickley. Lastly, I want to mention the well-hidden Anemos in Raghuvanshi Mills, which is very near your beloved Goodearth. Anemos is actually a shop retailing high quality ceiling fans (it’s on the row of units on the left, before you turn right into Goodearth. But if you go in and ask to look at the antiques, they will take you to a large showroom upstairs that is not visible from the street – filled with the most glorious selection of Indian and colonial antiques and art work. I love the staff here – so friendly, helpful and unobtrusive. The pieces are all very nice quality with some unusual items thrown in such as the book-shelves that fold up in different ways and the hexagonal, sectioned side tables. My husband and I have recently eyed up a gorgeous teak drinks cabinet for about 45,000 Rs. They will also give you a discount if you ask nicely. There are many other hidden places in Mumbai where you can hunt down antiques but I need to do much more research on that…perhaps I will do a Part 2 some day! I am not really one for posting recipes. Especially not for Indian food as that's really best left to the experts. However, an Indian friend tried out my recipe for Lamb Rogan Josh recently and said that it 'rocked'. And then it was only when I was making this dish myself tonight and peeling my own almonds to go in it (no Waitrose Finely Chopped Blanched Almonds here!) that I thought I would take a picture or two and then perhaps post my recipe. It is rather good after all. The finished product. The sauce is flecked with finely chopped almonds. One hour to cook or a bit more. 1. Fry the garlic and ginger in the ghee or oil until lightly browned. 2. Stir fry the cardamoms, cloves, bayleaf and cinnamon for 1 minute. Add the onion and further fry until browned. 3. Add the meat and fry until browned and the juiced sealed in. 4. Sprinkle on, one at a time, the cumin, chilli, paprika and coriander powder. Fry the mixture for two minutes. 5. Add the yogurt and salt; cover and cook for 5-7 minutes until dry and the oil separates. 6. 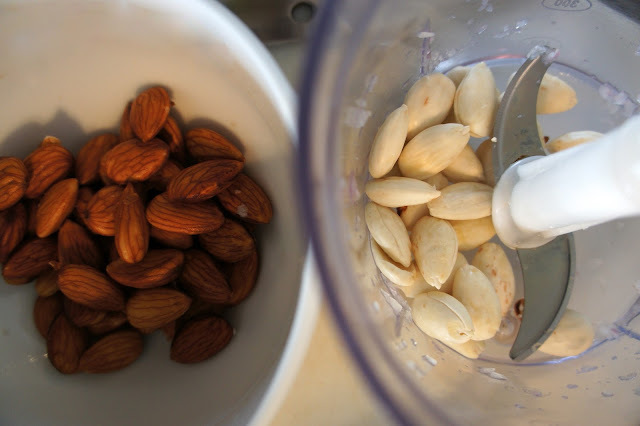 Stir in the almonds and poppyseeds if using. Fry for 1-2 minutes and then add the water. Cover and cook for 40-50 minutes gently simmering until the meat is tender and the sauce has thickened (we don’t like it too dry but you can simmer until it is drier). 7. Sprinkle with saffron, cover and gently cook for another 10 minutes, taking care not to burn the meat if you prefer it dry. Stir a few times to mix the saffron. 8. Serve with pilau, plain basmati or naan. 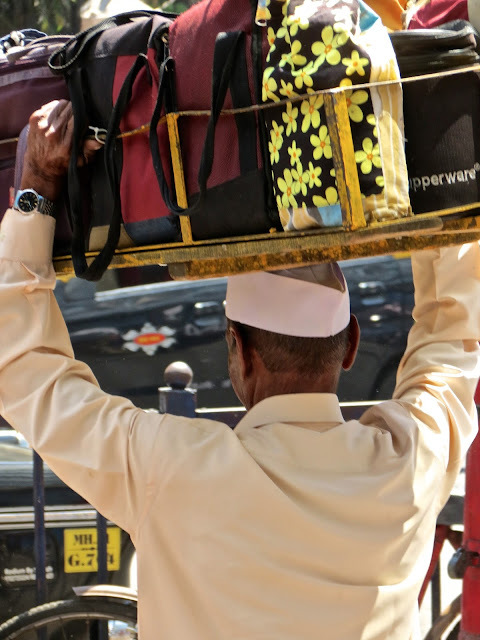 Yesterday 'The Ladies Wot Have Posh Cameras' travelled down to Churchgate Station in south Mumbai to observe the famous Dabbawalahs in action (Dabbawallas, Dabbawallahs, or Tiffin Wallahs). 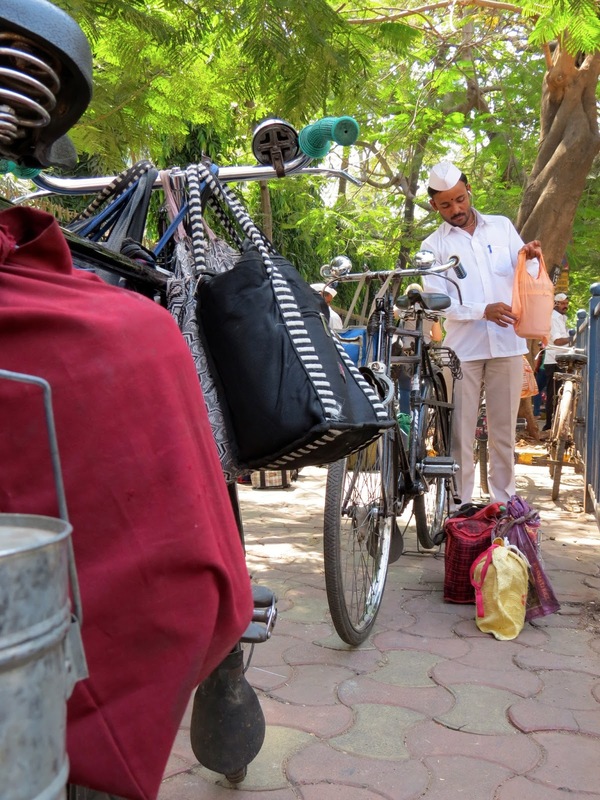 For the readers back home, a Dabbawala is a person whose sole job it is to collect home cooked 'dabbas' - basically packed lunches - from the homes of office workers and deliver them to said office workers via different modes of transport. After the packed lunch - or tiffin - has been consumed, the Dabbawala will re-collect the empty box and take it back home to the person's residence. 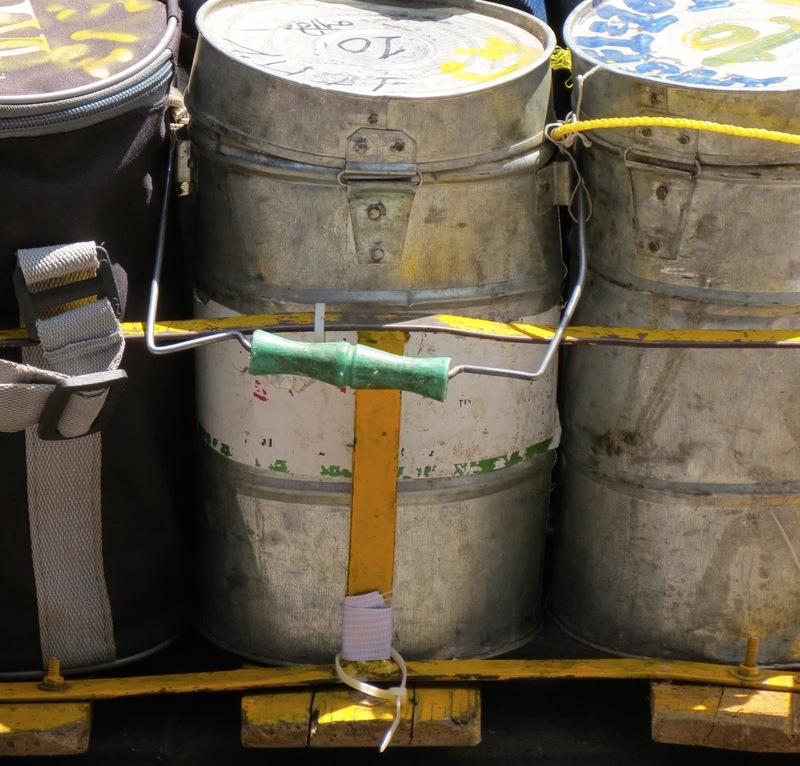 Each tiffin box usually contains two or three containers - mostly carrying traditional Indian foods such as rice, veg curry, chapattis and vegetables. No doubt with a fraction of the calories of a Pret-a-Manger sandwich. 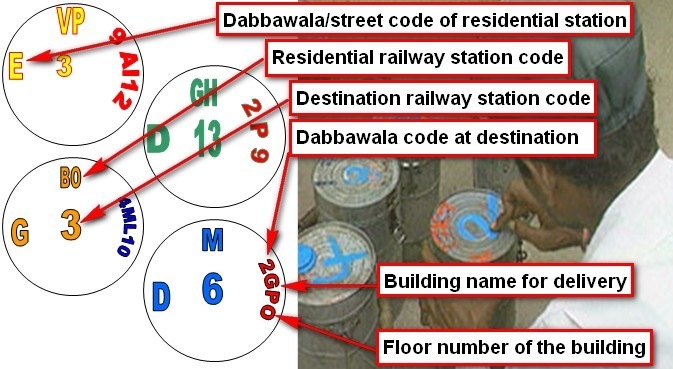 Every day, about 5,000 semi-literate Dabbawalas deliver a staggering 175,000 - 200,000 tiffins to Mumbai's office workers, using a colour and code marking system to ensure faultless delivery (codings, that would apparently baffle the most advanced of cryptographers). In fact, Harvard have made a study of this incredible delivery system due to the fact that mistakes only occur at a rate of one in six million - all done without the use of IT and cellphones. Beat that Tescos! And not only has our very own Prince Charles and Richard Branson been to meet the Dabbawalas of Mumbai, but back in 2004, the President of the Tiffin Suppliers Association addressed a group of 50 management gurus on the finer points of logistics management. Further, Forbes also awarded it a six sigma performance rating! (OK I don't know what that is but it sounds impressive huh?). There are many persons in the dabba chain between home and office - and the deliveries are made using a kind of relay system: A Dabbawala will collect around 30 lunch boxes at around 9-10am - he will then distribute these to other Dabbawalas at the train station dependent upon the final destination of the office worker. On the train journey into the city, each carrier can transport up to 40 packages on a long tray that they balance on their heads. 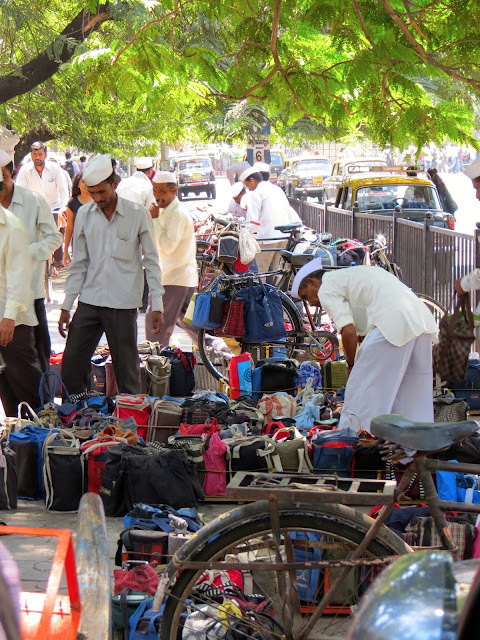 At the main terminus at the other end (in our case, Churchgate station but also commonly Mahalaxmi or Victoria Terminus), the dabbawalas stream off the train at around 11.30 am where they re-group outside the station to organise the onward journey of the lunches. The onward journey is usually by cart, bicycle or on foot through the heavy traffic. An amazing spectacle! The journey is then reversed upon collection of the empty tiffin boxes. Dabbas being collected and sorted for their onward journeys at Churchgate Station. We got told off by the police for trying to take pictures inside the station so we couldn't get any good shots of the Dabbawalas streaming off the train. Genuine, cheap and hygienic home cooked food guaranteed: For the majority of Mumbai workers, restaurants are way too expensive to be a daily solution. On the streets, numerous outside stalls sell for a few rupees different types of snacks that you have to eat standing on the pavement in the middle of the crowd and sanitary cooking conditions are not guaranteed! Food diversity of Indian people: With the diversity of Indian eating habits, it is very difficult to answer the specific need of each employee in a same place. “Veg” and “non veg” are usually the only two options that canteens are able to give, without taking care of all the different regime between religion, castes or geographic origin. 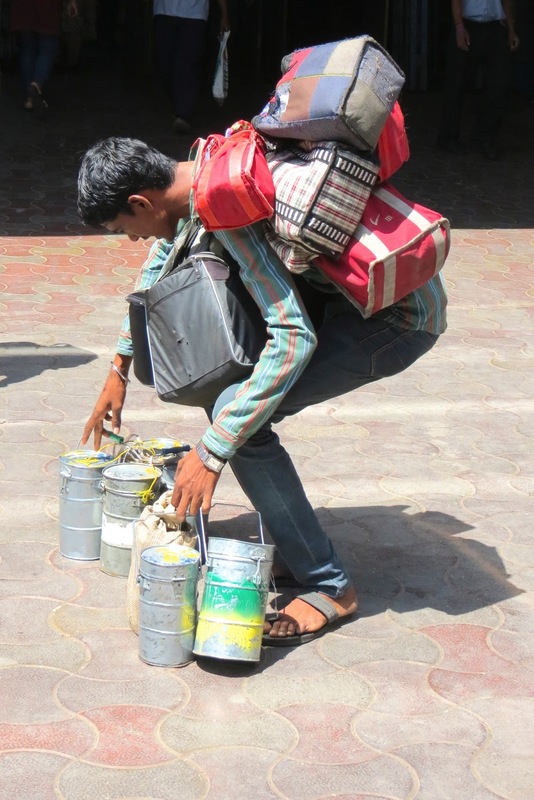 By delivering to each employee his tiffin filled with food prepared at his home, dabbawalas solve the problem. Time shortages: Many Indian workers have to leave very early in the morning to make their long commute to work - before 7am at least. It is enough that the individual or the Indian housewife has to get up, get their breakfast ready and send the kids off to school. 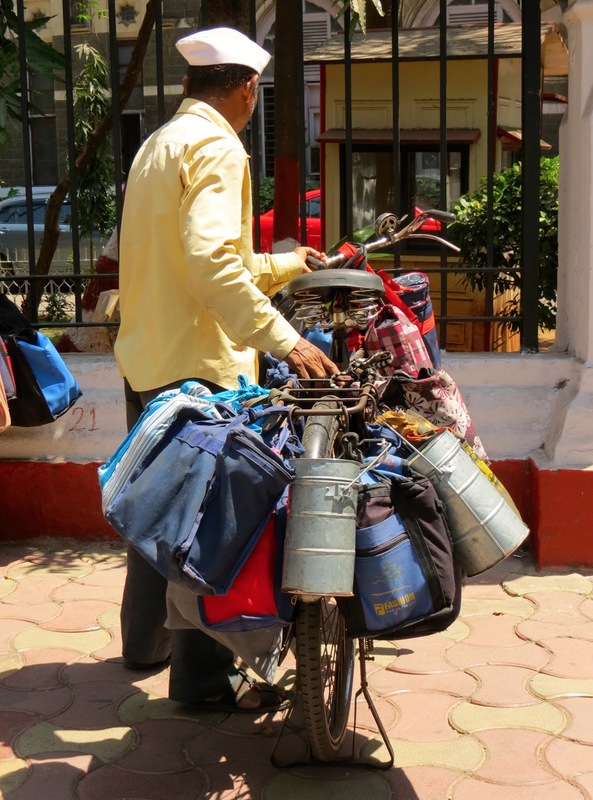 The Dabbawala service affords wives a couple more hours to prepare their husband's lunch - cooking it and packing it before it is picked up from their home at between 9am and 10am. Not only that, but on the extremely crowded trains of Mumbai, it means that workers can move unhindered - with both hands free to fight for precious space. Dabbawala as postman: In the days before mobile phones, housewives could send messages to their husbands in the tiffin package. And messages could be sent back from the husband upon collection of the empty box. (Probably 'do this, do that!' rather than 'I love you'...!). Dabbawala as status symbol: For those households who can not afford servants, having a Dabbawala deliver your lunch is seen as the first step to having staff. After all, the service is a mere few rupees a day - and is therefore a service that doesn't break the bank of ordinary workers. Especially in Mumbai where life is already so costly for middle class people. 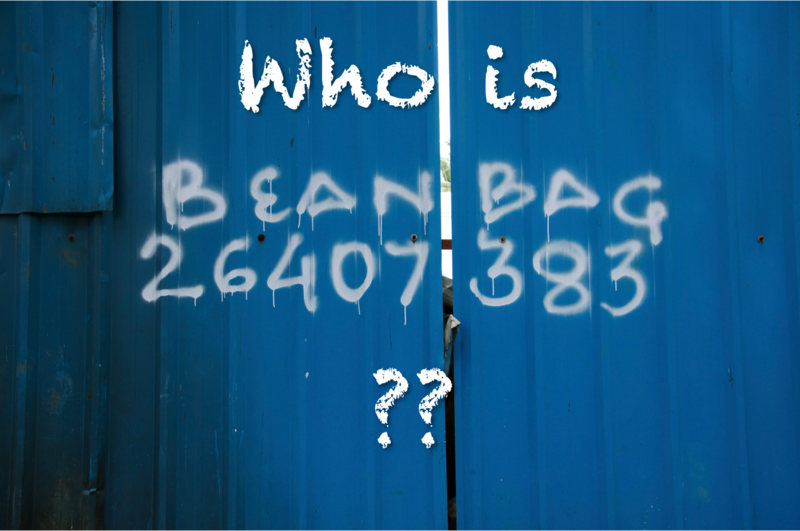 The service generally costs about 450 Rs a month (GBP 5.50 or $8) and the ingredients themselves - very little. So lesson over, here are more pictures! With re-distribution of the tiffins organised outside the terminal, they fill the cart and head off to nearby offices. Each tray can hold up to 40 lunches - try balancing that lot on your head! Biting off more than he can chew? 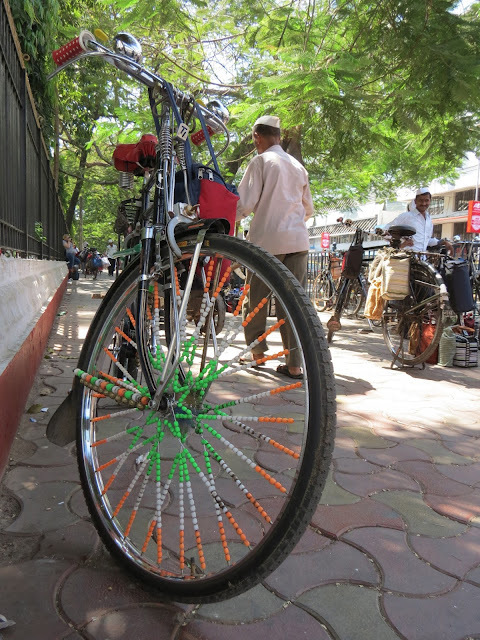 Most of the deliveries seem to be done by bicycle - dabbas hung off the handlebars and every other part of the bike! 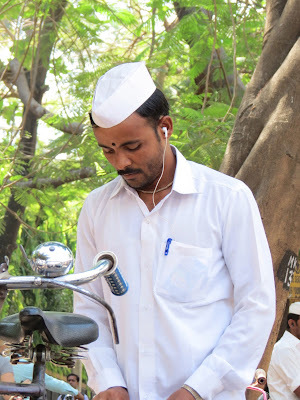 The Dabbawalas are from a tight knit community (mostly hailing from Pune in eastern Maharashtra) - so there is plenty of chatting and joking - and sometimes arguing - going on between the men whilst they work. They also have their own union and housing colonies and are very protective of their kind. 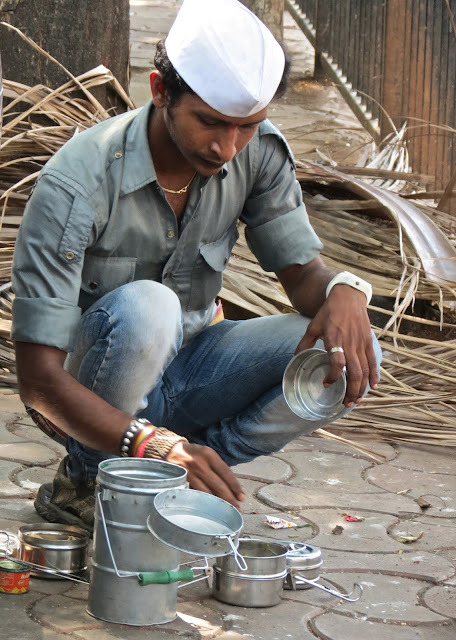 Dabbawala helping himself to his own dabba (I hope!). 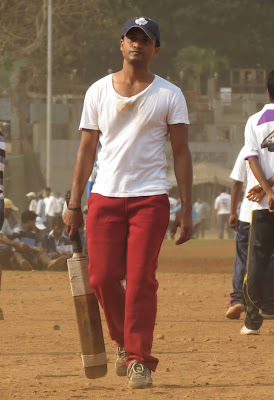 This guy was not wearing the traditional uniform but instead, jeans with a fancy belt and funky shirt (and gold chain).